Built on the legacy of its predecessor the BOS-18, the Clarke FM40 represents a significant step forward for Clarke orbital scrubbing floor machines. Available in a standard ST version and a feature-rich deluxe LX edition, the FM40 is engineered to deliver the ultimate combination of ease of use and versatility for unmatched performance in both wet and dry applications. Do not let the compact size fool you: the FM40 has a full 1.5 horsepower motor, 160 pounds of down pressure and a 3,540 RPM pad driver. That means cleaner floors with fewer passes and less strain on the operator. With a standardized 14 inch x 20 inch pad deck, the versatile FM40 is an ideal replacement for a variety of other equipment, too. In addition to scrubbing small, hard-to-reach areas where using a large auto-scrubber does not make sense, the FM40 also supplements Clarke BOOST machines to perform chemical-free floor finish removal. 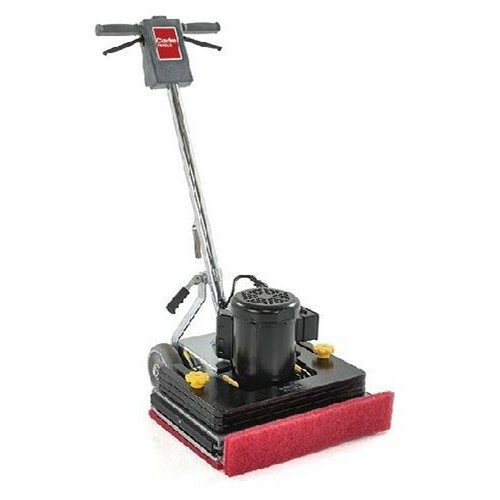 When paired with the appropriate pads, the FM40 floor machine can even be used to clean grout in bathrooms, prep gym floors for re-coats, bonnet clean carpet, and burnish terrazzo, marble, and concrete. Now you can clean baseboards without having to purchase a separate machine, or worse, getting down on your hands and knees to scrub. Thats because the FM40 LX comes standard with an innovative baseboard cleaner attachment. This simple device easily attaches to the front of the machine to provide a convenient alternative for cleaning baseboards. Prep a wide variety of floor surfaces using 3M SP, sand screens or Diamond Pads. Stop cleaning baseboards on your hands and knees with the standard baseboard cleaner attachment on the LX model. Featuring strategically placed vibration-dampening materials packed into its body, the FM40 is built to be quieter - even at a high operation speed. Less noise means you can clean effectively without disrupting the environment around you. FM40 LX: Deluxe Features - Enhance ease of use, functionality and transportation with the patent-pending, exclusive features of the FM40 LX. Easily switch between operating modes with the wheels up or on the floor. When the wheels are up, the FM40 LX provides the high fully directional maneuverability of traditional floor machines. When the wheels are down, it delivers high productivity forward-and-backward motion like a burnisher - with control so balanced that it enables single - handed operation and no fatigue. The FM40 LX easily disassembles without tools to maximize the convenience of transportation. Each of its modular attachment components is painted bright yellow for easy identification. This allows BSCs and other operators who frequently lift and transport their equipment between job sites to separate it into easily manageable pieces.